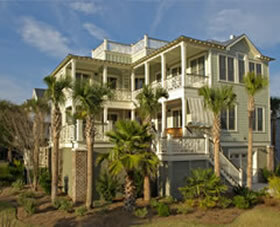 Situated just so, on the corner of Palm Boulevard & Palm Court on the Isle of Palms. A gracious southern lady who welcomes you to the Lowcountry with open arms. She come to the curb still dressed in her apron, trimmed with lace. (This is the South, after all). A generous hostess with plenty of room for friends and family… decks and piazzas, elevated pool, and a gourmet kitchen that’s perfect to cook up a Lowcountry boil for her whole hungry crew. 2nd row beach home on prestigious Palm Boulevard. Over 3,200 square feet HVAC (more than 7,500 total for all living areas). 5 bedrooms, 5 ½ baths. Dual master bedrooms, one on each floor. An ideal blend of modern conveniences & Old World detail… mahogany steps and decking, Old Savannah brick pillars, heart pine floors, 5-inch crown molding, spiral staircase to widow’s walk. Walk-in custom tile shower and separate claw-foot slipper tub in upstairs master bath. HardiPlank shake siding in a soft muted shade of green (“Gayle’s Garden”) reminiscent of Spanish moss. “Burnished slate” metal roof. hydro-sealed and treated with a non-slip texture). Wood/gas fireplace with slate surround. Gourmet kitchen (Wolf, Sub-Zero, Jenn-Air), farm sink set in granite. 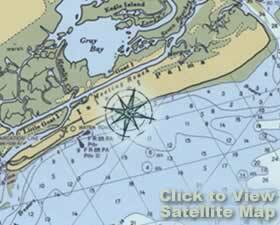 And an island, of course. Three wet bars (media room, outdoor grill area & kitchen). Granite, Corian & wood countertops. Recessed lighting, ceiling & paddle fans throughout. Security and fire alarm systems. Pre-wired surround sound & Cat5 cable.Elevator with phone. Convenient beach access side door & foot wash area. Extensive beach shower. Covered stairwell entry from protected parking area below. Lush landscape plan with palms to give privacy to the pool, raised berms and sea grasses. Automated irrigation system. Website Design by Zafari, Inc.